Within the framework of MED-Desire project, NREA already implemented two successful training courses in co-operation with both ENEA and Milano PolyTechnic. 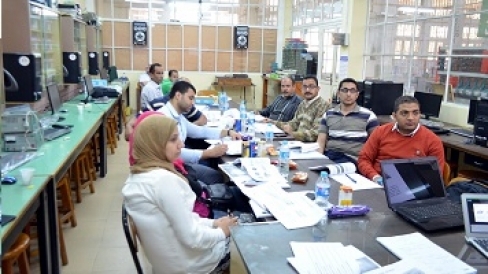 The first training course targeted Photovoltaic, PV, system installers at the Centre for professional education ‘institute of Don Bosco” in Alexandria from 19-23 April 2015. Around 12 candidates attended the Training-of-the-Trainers, ToT, course. Training was offered in 5 working days including both theoretical and practical lectures. In addition to, two days for both tutorial and practical final exam. The entire process was supervised by internationally accredited third party, APAVE, that issued certification for those who passed the exam. The second capacity building program has been held in Don Bosco at Alexandria, too, during 12-13 of May and it targeted SWHs installers. Around 20 candidates already attended this course. They get in-depth information regarding SWHs, which cover different technologies. The aim of such program is to create a technical workforce that will have knowledge about the design of SWHs systems and the best practices for installation, good maintenance and trouble shooting skills. For both capacity building programs, national experts get great benfits and are able now to transfer their knowledge into the national market and train others. We do believe that they are able to achieve both PV and SWHs technologies in Egypt.